Promising top quality and low priced services, CrazyXHTML.com offers affordable web design solutions that combine creativity with short delivery times. PSD to HTML and other format conversions are achieved in a timely manner that speaks quality and dedication for a top notch end result. Projects are always completed in the required timeframe, the companys staff promising a 24h deadline regardless of the tasks difficulty. The special design techniques that use a minimum number of CSS styles and XHTML tags facilitate a fast loading time for low-speed connections. Table-less HTML is great for people that require no standard HTML and depending on the projects size, they are qualified to receive certain discounts. Other services include Semantic Markup used for SEO, W3C Valid hand coded, XHTML 1.0 and CSS markup and a lot more and they are compatible with all versions of IE, Firefox, Opera, Safari, Google Chrome and SeaMonkey, rendering them very flexible. A 24h free customer support service ensures proper communication for 100% customer satisfaction guaranteed. Interested clientele can also take advantage of the PSD to XHTML or other format discounts up to 25% depending on the coding type, page number and the desired deadline. Thus, discounts are of 5% per extra day and go up to 5 days for a total of 25%. In a recent interview, CrazyXHTML founder, mentioned: We offer a money back guarantee on all of our services to maintain a healthy and professional relationship with our clients, whom can choose to pay for the project before or after completion. With a high range of professional services added to its portfolio, the companys team of experts brings precision to customers projects assuring they are falling between the quality standards demanded by their clients. Customer support is ready to address any type of questions, either by phone, chat or E-mail. CrazyXhtml.com is a web design company based in Prague consisting of highly trained specialists that offer state-of-the-art web design services at competitive prices. With integrated 24/7 free customer support and hundreds of successfully completed projects, the company is crafting a well deserved positive reputation. This entry was posted in Which Open Source Blog and tagged Conversion, CrazyXHTML.com, Launches, Starting, Types on August 31, 2012 by Administrator. Cinsay, a leader in social video commerce technology, has announced today compelling conversion statistics for their Smart Store technology. The worlds first-ever technology combines video with ecommerce, donations, and lead generation all inside a patent-pending platform called a Smart Store. The companys analytics show conversion rates averaging approximately 9% and click to take action activities beyond the conversion (take action conversions divided by item clicks) average an unmatched 42%. Click to take action includes ecommerce, link outs, donations, and lead generation or request for information features. In the business world where 1 or 2% difference in conversion rates can mean millions of dollars to retailers, this is great news, said Christian Briggs, CEO and Founder of Cinsay. Weve already seen all the compelling data showing how video increases sales for products and services. Cinsay seamlessly uses that technology to offer consumers donations and commerce directly inside the video, Briggs added. Businesses and individuals are recognizing what the technology can do for there business. Since launching the Smart Store platform at DEMO Spring 2012, Cinsay has seen an increase in registrations/sign-ups of nearly 2,100 for its video commerce platform; up dramatically from just a few beta testers earlier this year. The growth of video for both online and mobile is rapidly expanding. According to a study by comScore, between February 2011 and February 2012, video views and creation of media grew by 660%. 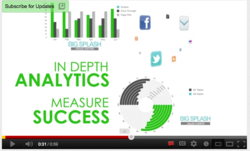 In June alone, over 180 million Americans viewed a staggering 33 billion videos online. However, the challenge for merchants has been the ability to actually monetize that rapid expansion and viewership. Cinsay provides viewers the ability to shop directly inside the video versus linking out to other static pages. The additional steps to make a purchase or donation have also shown to increase cart abandonment; Cinsays technology can reduce those additional steps. Additionally, Cinsay has added in-depth analytics for merchants to measure views, shares, take action, conversions and more in order to optimize their stores performance and success. People are watching and sharing video like never before and much of that media is related to products and services. In fact, Media Post and Website Magazine reported that consumers were captivated by video 60% of the time it was presented to them and that 52% of viewers reported having more confidence with their purchases when ecommerce was accompanied with video. And the same data translates beyond ecommerce to donations and lead generation. For example, Sneak Peeq, a leading social shopping company, used Cinsay to acquire new customer leads. We worked with a lot of other companies in the past and the results just werent impressive. Cinsays use of cutting-edge technology in video ecommerce and social media have really given us the competitive advantages we need for amazing ROI, said Judy Zhu, Chief Merchandiser at Sneak Peeq. Cinsay has created a next generation eCommerce, viewer interactive, video-based platform for any size businesses. Cinsays SaaS based technology enables anyone to sell products, capture donations, and generate leads all inside the patented Smart Store. Cinsay also manages end-to-end social media and blogger campaigns through its ten million plus blogger network. Customers are offered a complete turnkey business via merchant account services as well as an exclusive on-demand solution featuring dozens of personal, brandable products like t-shirts, caps, mugs and iPhone covers. Self-managed and managed customers benefit from Cinsays in-depth reporting tools and real-time statistical data. Cinsays embeddable platform is compatible with web and mobile HTML5 devices and is highly scalable via its enterprise-level hosting and distribution network. Forbes has named Cinsay as one of Americas Most Promising Companies and by eTail Conferences as a Rising Star in innovation for 2012. The industry average for ecommerce conversions is around 1.5% for traditional, static-page shopping experiences. Video and social media are two factors, which have shown to influence buying behavior into higher conversion rates. The Cinsay Smart Store technology uses both video and social media as well as offering shoppers the ability to purchase inside the video. While many of Cinsays clients experience higher conversion rates (which are derived from using Cinsays own proprietary software systems), the company and the technology itself does not guarantee the same results for all users. The success of ecommerce and take action conversions are influenced by many factors including: incentives, price, product, service, brand, audience, value, design and presentation of the promotion as well as outside market conditions and events. Results for the data reported were measured for deployed Smart Stores from May 1, 2012 to July 31, 2012. This entry was posted in Which Open Source Blog and tagged Approximately, Average, CINSAY, Conversion, Delivers, eCommerce, Inside, Platform, Rate, Smart, Social, Store, Technology, Unprecedented, Video on August 31, 2012 by Administrator. It is Enhanced with AJAX , Seamless and Fastest experience. This entry was posted in Which Open Source Blog on August 31, 2012 by Administrator. Dr. Jack Gunter and Dr. C. Spencer Cochran, cosmetic plastic surgeons in Dallas, recently attended an Innovation Summit in New York, NY produced by Ethicon, Inc. and Mentor Worldwide LLC to discuss the PDS Flexible plate, its recent approval by the FDA, and the uses of the plate in rhinoplasty procedures. Dr. Jack Gunter was one of two clinical surgeons invited to give a presentation on the potential uses for the PSD plates in septorhinoplasty. As consultants and part of an advisory board for Ethicon, Inc. and Mentor Worldwide, the doctors have worked closely with the companies Research and Development teams over the past two years to refine the synthetic bio-absorbable material that serves as a scaffold for cartilage reconstruction in rhinoplasty procedures. With recent approval from the U. S. Food and Drug Administration, the PDS Flexible Plate will improve a number of procedures Dr. Gunter and Dr. Cochran offer, including nasal rhinoplasty in Dallas. The new product will potentially decrease the surgeons needs for obtaining additional cartilage from other locations on the body, such as the ear or rib. While the Gunter Center for Aesthetics and Cosmetic Surgery offers a number of cosmetic procedures, including facelifts and breast augmentation, Dr. Gunter and Dr. Cochran focus exclusively on rhinoplasty in Dallas. As the rhinoplasty procedure requires a keen sense of technical skill and aesthetic artistry, the doctors say the use of the PDS Flexible Plate will further improve their ability to provide attractive, natural-looking rhinoplasty results. Dr. Jack Gunter is certified by both the American Board of Plastic Surgery and the American Board of Otolaryngology. He earned his medical degree from the University of Oklahoma School of Medicine, and completed his general residency at the University of Arkansas Medical Center. Dr. Jack Gunter completed his Otolarygology residency at Tulane Universitys EENT Hospital, and his plastic surgery residency at the University of Michigan. He completed an NIH Fellowship in Facial Plastic and Reconstructive Surgery, and is a member of the American Society of Plastic Surgeons, the American Society for Aesthetic Plastic Surgery, the American Association of Plastic Surgeons, as well as a number of other organizations. C. Spencer Cochran, MD is certified by the American Board of Otolarygology. He earned his medical degree from the University of Texas Health Science Center at San Antonio, and completed his internship in general surgery as well as his residency in Otolarygology at the UT Southwestern Medical Center at Dallas. Dr. Cochran is a member of the American Academy of Facial Plastic and Reconstructive Surgery, the Rhinoplasty Society, and the American Academy of Otolarygology-Head and Neck Surgery, among others. This entry was posted in Which Open Source Blog and tagged Approval, Attend, Cartilage, Cochran, Dallas, Gunter, Jack, Management, Material, Plastic, Recent, Rhinoplasty, Spencer, Summit, Surgeons on August 31, 2012 by Administrator. IPEVO, a maker of technology products and accessories for education, business, and consumers, has announced a new 20% Off promotion for their Online Store at http://www.ipevo.com. This promotion begins now and ends on Sunday, August 12. Participating products include all of the Cote&Ciel brand products available in the IPEVO Store as well as select IPEVO accessories for iDevices like Apple’s new iPad 3 and the iPad 2. Paris-based Cote&Ciel offers high-end products which “promote creative functionality and empower individuality in lifestyle travelgoods.” Cote&Ciel products for the 20% Off promotion include the Stand Bag for iPad, the Pillow Stand for iPad, the Laptop Traveler Bag for 15″ MacBook Pro, the Laptop Carrier Bag for both 13″ and 15″ MacBook Pro, the Kit Bag (which is designed to carry smartphones and other small items), and the Tablet Kit Bag for iPad. These selections come in a variety of colors. This entry was posted in Which Open Source Blog and tagged Cote&Ciel, Covers, Instant, IPEVO, Offers, Products, Promotion Discount, Select on August 31, 2012 by Administrator. In a rare public appearance, internationally acclaimed and celebrated British scientist Professor Stephen Hawking inspired the world tonight with a global message of hope and optimism at the Opening Ceremony of the London 2012 Paralympic Games. Hawking, one of most respected, innovative and original thinkers of our times, urged the world to be curious and to create a brave new and better world for everyone, by challenging perceptions and stereotypes that limit the potential of the human body, mind and spirit. Look up at the stars, and not down at your feet. Try to make sense of what you see, and wonder about what makes the universe exist. Be curious, Hawking urged ceremony spectators and international television and internet audiences who watched the Ceremony on TV and online, and added that however difficult life may seem, there is always something you can do and succeed at. Professor Hawking delivered a series of new statements and messages and played a key role in the ceremony combining soaring operatic performances with alternative British urban punk and international cinema cult music and songs, dramatic high wire aerial performances and dance movements across the roof of the stadium. The Ceremony’s high technology special effects also included dramatic multi coloured and rapid moving shapes and formations created by pixel technology that transformed audience seating areas into a giant screen for high impact digital images, including sea and solar landscapes. Stephen Hawking called for a new age of enlightenment as he acts as a guide to Miranda, one of the characters from Shakespeares The Tempest, taking Miranda, Sir Ian McKellen, and a worldwide audience on a journey through time and the great discoveries that have changed our perceptions about the possibilities of the human mind and spirit and the physical universe. In the best traditions of quirky British humour, tonights ceremony also involved the worlds biggest apple bite in a tribute to Sir Isaac Newton. The massive collective crunch took place in the appropriately named Gravity section of the ceremony and involved more than 60,000 audience members simultaneously taking a bite from thousands of apples that were given on arrival at the ceremony. TV viewers were also asked to bite an apple at home at the appropriate moment. Seb Coe, Chair, London Organising Committee of the Olympic and Paralympic Games (LOCOG), welcomed the world to the home of the Paralympic Games. In his speech in the Ceremony he said: The enthusiasm for these Paralympic Games is extraordinary. The crowds will be unprecedented. These will be Games to remember. Prepare to be inspired. Prepare to be dazzled. Prepare to be moved by the Paralympic Games of London 2012. The London 2012 Paralympic Opening Ceremony was created by artistic directors Jenny Sealey and Bradley Hemmings and provided a theatrical and emotional homecoming for the Paralympic Games. The Ceremony was overseen by the team of Executive Producers who were in charge of all four Olympic and Paralympic Ceremonies, including Oscar winning film director Stephen Daldry. Athletes from 164 teams paraded into the Stadium early in the Ceremony to be seated on the field of play. The Ceremony, inspired by their achievements, unfolded in front of them set to a score of classical and dance music. A new choral commission Principia by Greenwich composer Errollyn Wallen was performed by six London based choirs including the Hackney Singers, London Gay Mens Chorus, the London Chorus, Lewisham Choral Society, Barts Choir and Hackney Community Choir before the arrival of Her Majesty the Queen who, following speeches by London 2012 Chair Sebastian Coe and International Paralympic Committee President Sir Philip Craven, officially declared the London 2012 Paralympic Games open. Nine servicemen and women from the Army, Royal Navy and Royal Air Force raised the Union Flag to the accompaniment of Benjamin Brittens arrangement of the National Anthem, performed by the 430-strong choir. Their journey looked out into deep space following a dramatic interpretation of the big bang performed by 600 volunteers, before encountering a Stadium sized library where Miranda investigated the twin themes of the Ceremony reason and rights, a voyage across a sea of ideas in a giant upturned umbrella boat, a spectacular recreation of Isaac Newtons 17th century garden before ending up in the dynamic world of contemporary London where Ian McKellen and Miranda walked together towards an exciting future and current scientific endeavours, such as the Large Hadron Collider. As well as a 3,000 volunteer performers and a childrens cast from the Host Boroughs, the London 2012 Paralympic Opening Ceremony featured soprano Elin Manahan Thomas performing Habdels Eternal Source of Light Devine; contemporary whirling dervish dancer Ziya Azazi creating the eye of the storm during Mirandas storm of ideas; 16 year old singer songwriter Birdy performing Anthony Hegartys Bird Gerhl to accompany a solo dance by leading disable dancer and performer David Toole; Gandini Juggling performing during a section celebrating Sir Isaac Newtons discoveries; a new track by British electronic duo Orbital used in section celebrating Britains lead in modern scientific discoveries; Graeae Theatre Companys performance of the late Ian Durys disability anthem Spasticus Autisticus; and the Beverley Knight was joined by Lizzie Emeh and Caroline Parker grand finale of the Ceremony which saw a rousing performance of I Am What I Am. The Ceremony also featured a spectacular aerial performance by 42 Deaf and disabled ariel performers who have been specially trained to perform at height. Having taken part in an eight week circus skills training programme funded by Arts Council England, they will feature throughout the Ceremony showcasing their new found skills. They include established performers as well people new to the arts such as rehabilitating soldiers and non competing Paralympians. Stephen Hawkings final address provided a moving tribute to the athletes. He said: The Paralympic Games is about transforming our perception of the world. We are all different, there is no such thing as a standard or run-of-the-mill human being, but we share the same human spirit. What is important is that we have the ability to create. This creativity can take many forms, from physical achievement to theoretical physics. However difficult life may seem there is always something you can do, and succeed at. The Games provide an opportunity for athletes to excel, to stretch themselves and become outstanding in their field. So let us together celebrate excellence, friendship, and respect. Good luck to you all. Then a short, emotionally charged film showed the journey of the Paralympic Torch to the Stadium and pyrotechnics in the colours of the Paralympic logo were set off around the Stadium roof. At the end of the film, Royal Marine Commando Joe Townsend an aspiring Paralympic triathlete emerged with the Torch at the top of the ArcelorMittal Orbit, just outside the Stadium, and descended on a zip wire onto the field of play. This entry was posted in Which Open Source Blog and tagged 2012, Appearance, Calls, Ceremony, Enlightenment, Games, Hawking, London, Opening, Paralympic, Professor, Public, Rare, Spectacular, Stephen on August 31, 2012 by Administrator. First of all, Thanks so much for purchased our items We’re really appreciated it and hope you enjoy it! If you need support, all support will be conducted through our support forum (http://support.goodlayers.com). We usually get back to you within 48hours. (except holiday seasons which might take longer). DNA Response, Inc., provider of turnkey multi-channel e-commerce, on-line marketing and order management solutions, is launching a major Labor Day promotion. As of now they are offering some of their most popular items with great specials. The wide variety of products includes the Jay Kordich Juicer, which is a powerful juicing machine from the father of juicing himself, so customers can unleash the healing power of juice. Customers will receive free 1-month supply of Jay Kordich Living Greens Multivitamin capsules containing over 30 most nutrient-rich super foods, which were processed at low temperature to preserve their nutritional value. They are also offering their famous Silkn products that range from a painless permanent hair remover, to a light based device that revitalizes your skin. The Rest-n-Roll, a roll-away bag great for convenient storage that also doubles as a fold out seat, will be available with special gift purchase. Frego shatterproof glassware if being sold at a 35% discount, marking the price down from $ 79.95 to $ 49.95. Other hot products include the multipurpose polish, Shadazzle, Bright Night, which is an umbrella that illuminates your path, and a stylish line of watches. Customers will have an entire week to catch these deals starting on August 28th, and will not need to enter any promo code. The promotion will last until September 4th. About DNA Response. DNA Response, Inc. (DNA) provides turnkey e-commerce, online marketing, and order management services to companies in the 0 Billion direct response market. DNA clients sell products direct to consumers using TV, radio, print catalogs, web and mobile as their sales channels. DNAs ECOM2 platform utilizes state-of-the art cloud computing technologies and services to improve operational efficiency by reducing transaction costs, eliminating credit card declines, and lowering order cancellations and product returns, while simultaneously increasing online revenue for our clients. DNA provides universal order management for processing orders in real time from all the sales channels with full visibility to the business for the clients. DNA generates incremental revenues and helps build a brand for our clients by providing comprehensive e-commerce and online marketing services. This entry was posted in Which Open Source Blog and tagged Labor, Launched, Promotion, SeenOnTVProducts.tv, Store on August 31, 2012 by Administrator. Blacknight are reaffirming their commitment to Irish domains with deep discounts on .IE registrations and transfers. 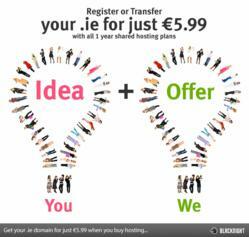 The leading Irish domain registrar and hosting company are offering .IE domains for 5.99 with the purchase of a Blacknight hosting package. Michele Neylon of Blacknight states: We love giving discounts and were looking for a way to celebrate the announcement of our new, green data centre. We couldnt think of a more perfect way to celebrate the ground breaking on a local Irish data centre than by promoting .IE domains. Neylon continues: We are a proud, Irish business and have made it our mission to help other Irish businesses establish an online identity. Whether it is a website, mobile site or online store; it is our goal to help Irish businesses expand their presence. We are heavily committed to investing in the Irish economy and want to provide others with the tools to do the same. Blacknight (http://www.blacknight.com/) are an Irish based, ICANN accredited domain registrar and hosting company. Recipients of several awards for their revolutionary use of social media, Blacknight are one of Europes most cutting edge Internet companies. Blacknight constantly seek to lead the way by introducing innovative solutions for its client base and provide dedicated servers and colocation as well as a comprehensive range of Microsoft Windows and Linux based hosting plans and domain name registration services to business globally. This entry was posted in Which Open Source Blog and tagged Blacknight, Customers, DOMAINS, Flags, Invite, Irish, Proudly, their on August 31, 2012 by Administrator. We are proud that our robust and feature-full support for mobile sites plays a part in the delivery of this potentially life-saving information to users fingertips in emergency situations. said Petr Palas, the CEO and founder of Kentico Software. Created by the City of Jacksonville’s Information Technology Department and Emergency Response teams, JaxReady is on the cutting edge of this kind of technology. Developed at no cost to taxpayers the application was built on Kentico CMS with existing resources, and is offered free at iPhone and Android application stores. Jacksonville is proud to lead efforts that provide residents with useful, up-to-the-minute storm information through the JaxReady app. This is a great example of how city governments can use existing resources to reach people in new and innovative ways to provide a higher level of service and safety, said Jacksonville Mayor Alvin Brown. Having used Kentico CMS for its main website for over two years, its flexibility, stability and ease-of-use during development and management meant that Kentico was the obvious platform to fully manage and deliver the content presented on JaxReady, says Richard Baker, who developed the application for the City of Jacksonville. Kentico CMS mobile website features continue to be enriched, with version 7 introducing mobile device profiles and layouts, allowing the preview of appropriate mobile screen sizes in a browser and the creation of mobile-ready or mobile-convertible websites. A PSA about the app is available for online use at http://www.youtube.com/mayoralvinbrown. Kentico CMS customers can expect a highly flexible platform with a uniquely easy-to-use user interface. Its currently used by more than 12,000 websites in 87 countries. The clients include Microsoft, Guinness, McDonald’s, Vodafone, O2, Orange, Brussels Airlines, Mazda, Ford, Subaru, Isuzu, Samsung, Gibson, ESPN, DKNY, Abbott Labs, Medibank, Ireland.ie and others. Kentico Software (http://www.kentico.com) helps clients create successful dynamic websites, intranets, community sites and e-commerce solutions using Kentico CMS for ASP.NET. It’s committed to deliver a full-featured, enterprise-class, stable and scalable Web Content Management solution on the Microsoft .NET platform. Founded in 2004, Kentico is headquartered in the Czech Republic and has offices in the United States (Nashua, NH and Seattle, WA) and United Kingdom (Reading). Since its inception, Kentico has continued to rapidly expand the Kentico CMS user base worldwide. Its partner network consists of 1,200 partners in 80+ countries. Kentico Software is a Microsoft Gold Certified Partner. In 2010, Kentico was named the fastest growing technology company in the Czech Republic in the Deloitte Technology FAST 50 awards. This entry was posted in Which Open Source Blog and tagged Chooses, City, Emergency, Jacksonville, Kentico, Mobile, Preparedness on August 31, 2012 by Administrator.